My brief trip this weekend to the Romance Writers of America 2015 Annual Convention in New York was a blast! It’s always so much fun to connect with my tribe: fellow writers, and especially fellow YA romance writers. Truly the nicest people on the face of the earth. 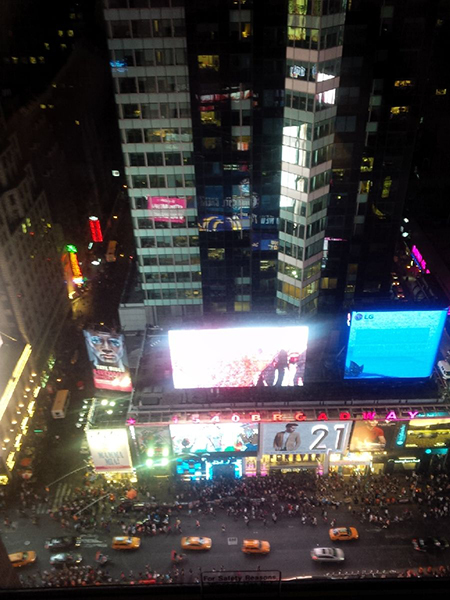 Yes, that’s Broadway down there. Bright lights, big city, and basically fun, fun, fun central. A horrible spot for a hotel room if you actually want to sleep, but lucky for me, sleep was not high on my priority list. 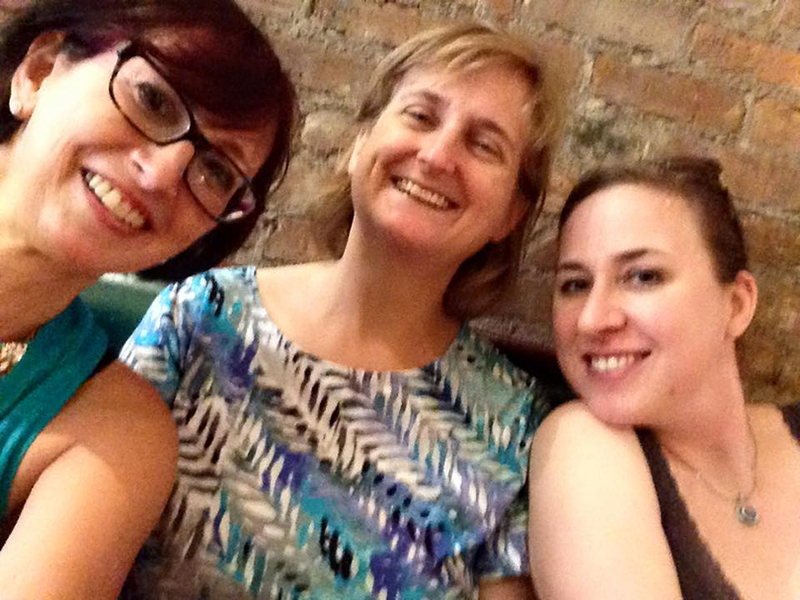 Before the event, I met up with two dear friends, fabulous YA author Lisa Amowitz and rock star middle-grade author Kate Chell Milford, for a 3.5-hour lunch at O’Lunney’s Irish Pub. Caught up on a bunch of the latest publishing world gossip and had the most AMAZING hard pear cider. I highly recommend it if you’re in that neighborhood. Many thanks to Lisa (on the left) for her mad selfie-taking skills. Can’t you tell she’s an artist by the way she tilted the angle just so? Next it was on to the YARWA “Evening of YA.” What do you get when you put about 90 YA romance authors in a room together? Lots of estrogen. And beautiful smiles. And laughter. And did I mention the niceness? So, yeah, a very fun night. Yay! My third book (which does not yet have a firm publication date), THE BOYFRIEND WHISPERER, won first place in the YARWA Rosemary Award for Contemporary Fiction. I was so thrilled, and this vote of confidence for the manuscript makes me so excited to finish and polish it up so I can share it with the world! Coming up in my next post: EM & EM cover reveal excitement. So as I mentioned in my last post, I have some exciting news on the writing and publishing front. Some of you probably already know about it because I tend to share and squeal and generally blow up my followers’ Facebook feeds when anything the least bit cool happens … which I won’t apologize for, because as I always tell fellow writers, in this business you have to celebrate every victory, even the small ones. Publishing is full of heartache, so it’s important to enjoy the good parts! THE FUNERAL SINGER author Linda Budzinski’s EM & EM, in which a sixteen year old Jersey girl experiences an epic do-over as she’s forced into witness protection in the Midwest, to Georgia McBride of Swoon Romance for Publication in fall 2015 by Andrea Somberg of Harvey Klinger. The publication date is currently set for October 27, 2015, which will be here before we know it! I’ve seen a draft of the cover and I LOVE it! Can’t wait until the reveal date so everyone can see it. EM & EM is a little bit dark, but it’s also a sweet romance, and I think the cover manages to capture both aspects. You can read more about the premise and add EM & EM to your “to be read” list on its Goodreads page. UPDATE: My release date has been moved up to September 22, 2015 September 15, 2015! That’s REALLY coming up quickly! Also, the cover reveal will be August 12 … can’t wait for all of you to see it! But that’s not all! I have some fun news regarding the novel I’m currently writing as well. 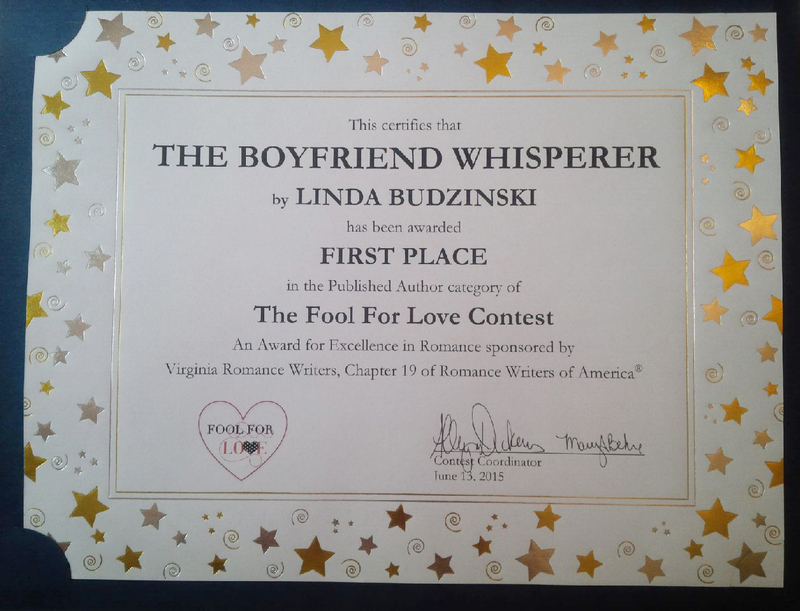 THE BOYFRIEND WHISPERER took first place in the Published Author Category of the Virginia Chapter of the Romance Writers of America’s annual Fool for Love Contest. Isn’t that certificate so shiny and pretty?!? This was a real honor, and of course, it’s always wonderful when you’re working on a project to know others feel it has merit. Very motivating! And that’s STILL not all! THE BOYFRIEND WHISPERER also is a finalist in the Contemporary Category of the Young Adult Chapter of the Romance Writers of America’s annual Rosemary Contest. I will be heading up to New York in a few weeks for the awards ceremony, so wish me luck on that one! So THAT is all my news! Stay tuned for the EM & EM cover reveal, a report from the NYC Awards Ceremony and more!